Also, I just got my moe little Nendoroid Saber Lily. She's so cute! Pictures once I get a camera. Feel free to post anything here including gundams and mechas. I suppose can post other figurine or what ever collection if u want to. Just though that posting posed scenes would be a bit more interesting. Oh, that. I usually go for clothes that are more..."ninja-like". Stuff that does not broadcast my ...interests....which might scare off the normal people. Which is why I got the Gurren Lagann jacket. At first glance, it's just a stylish jacket with a nice fire symbol. But only those who have watched GL would know it for what it is. Ahaha. That said, I do have a Saber T-shirt that I wear at times. Usually at conventions. Wow. 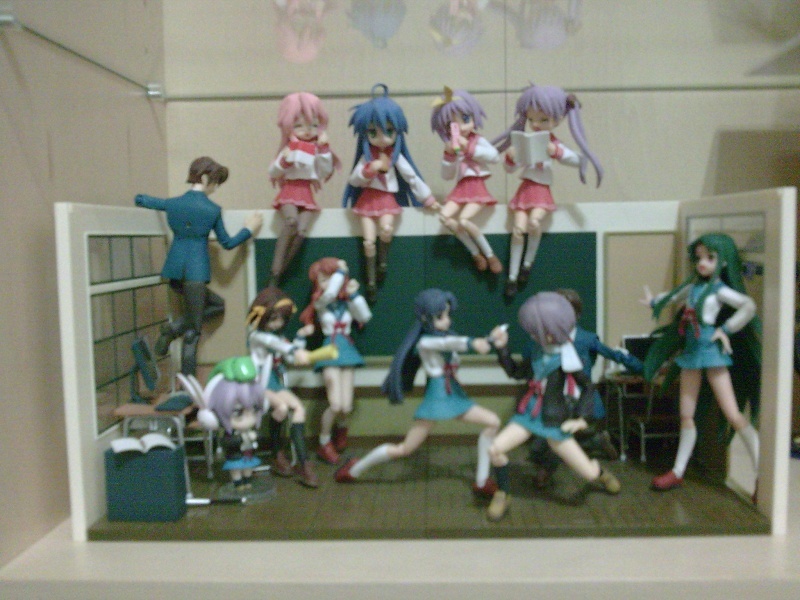 You sure are VERY willing to spend on your figurines. Impressive. Where's your manga? I only see a small pile. oh all my manga and dvds are in 2x 50cm by 40cm by 30cm boxes...as well as a few more in shoeboxes here and there i also have another 50x40x30 box filled with flattened figurine boxes...dun think that really counts though...a box of boxes but it does take up space. oh that pic was taken b4 i got my c.c harem... now where the head of my bed is there is a C.C./C.C. dakimakura, the side next to the table has C.C. (with lulu face down) and the ikea pillow. I have 4 square pillows, C.C./C.C. , C.C./Karen , K-On, Yami(To-LOVE-ru); And one more small haruhi/yuki/mikuru rectangular pillow, at 35x55cm its smaller than the 45x45cm square pillows...i sort of store those 4 + 1 pillows in the shelf at the foot of my bed...then every night i just decide which one i feel like sleeping for that night. oh yea i also added some posters (put into a3/4 plastic sleeves (those with holes at the side) above my bed. the plastic sleeves are in portrait orientation with the holes at the top, would need to get a portrait porientation file if i want to put them away. Used plastic sleeves so that i can change them if i feel like doing so. also becuz some of them are on reletively thinner paper, dun want to damage them with tape or blu-tak. Hahahaha. I can imagine it quite well. What a nice harem. Maybe I should start collecting some too. oh dear. that first pillow is the start of a whole reverse harem. now joan's digging deeper into the dark side. but wow, gaius, your room's pretty organised. Hahaha. It usually have to start with something 'small' first. My wallet isn't that deep, I won't be going over to the dark side so fast. I guess most people otaku corner should be relatively neat. Gaius, I can totally see you're at the far end of the dark side, waiting for people to join you? hmmmm far eh...though how far exactly is probably not visible from my room alone u know...and also...there are 'nicer' ways to phrase "going over to dark side"...something like..."being enlightened" and "seeing how deep the rabbit hole goes" amongst other euphemisms. Or how about, "You are so far gone that you've come around behind us and said hi"? If I don't use the Dark Side analogue, how am I gonna use my Darth Vader/Palpatine quotes? You can always call it "investing in plastic" or "appreciation of modern visual culture based sculpture" Ya can even put that on your resume! kageshiro-san, do u actually allow other ppl to come into contact with ur collection?? If u dun mind i would love to take a look at ur precious corner. Were you there for our Subclub Meet and Greet, chiller? Kage-san brought about...1/3 of his collection there. Lol, the only figurine I have is a Saito Hajime nendroid...my parents aren't big on me wasting money on stuff like this.